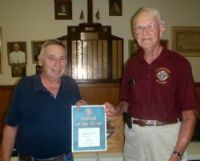 GK Bob Langenhorst awarded Ron Kordick a Knight of the Year award for various contributions since joining Council 1382 and becoming Financial Secretary, including gathering newsletter inputs and assembling and mailing them out, and co-chairing the Tootsie Roll drive. Ron felt that there are many knights who should receive the award before him, including Paul Kauling and Chad Holthaus who have held and continue to hold very important positions in the council to keep it going. At the May 2018 membership meeting, GK Bob Diekemper presented a Knight of the Year award to Jim Etter to recognize his contributions over the last several years. Since no Knight of the Year awards have been presented in the last several years, GK Bob Diekemper presented the award to Ray Rainey, Herb Pingsterhaus, and Bob Langenhorst at the April 2018 meeting.